Being a Chief Data Officer in the current climate is a rather interesting place to be, it can feel a little like dancing on quicksand while you have to learn to juggle wriggling snakes. So in order to help people interested in this area, whether you are a new CDO, well established data hero or just wondering what all the fuss is about, we have worked on a set of articles to answer some of the questions we are asked at nearly every conference we go to. While we can't promise you a solution to all your data related problems handed to you on a plate, we can promise that once a week you can look forward to another concise, interesting and easy to read article to help you on your data and information related journey. The previous article raised the issue of the ‘hype cycle’ when discussing the ability of the new CDO to shift between the tactical and the strategic. Currently the CDO role is relatively new in many organisations, and even if it is not, the CDO will arrive into an atmosphere of great expectation. There will be common sentiments that will greet the new CDO: ‘the business will be transformed into a data driven business, an organisation capable of making better and more informed decisions based on data, data science will bring the business better insight into its customers and operations, the new CDO will bring big data’. Data risks on the business risk register may even have the arrival of the new CDO as a mitigation. There will be great expectation about the arrival of the CDO, however there will in most cases be a lot of good will and enthusiasm in the business for data success. One of the biggest threats to the CDO, certainly in the first 24 months, or first 1.5 financial years, is the ‘Trough of Disillusionment’ in the hype cycle. Data is a new profession at C-Suite level; colleagues, the board or the business may be expecting quick results from the new data driven world. The CDO must navigate their way around this hype, if they do so successfully they will maintain credibility and sustain the all-important good relationships across the business. 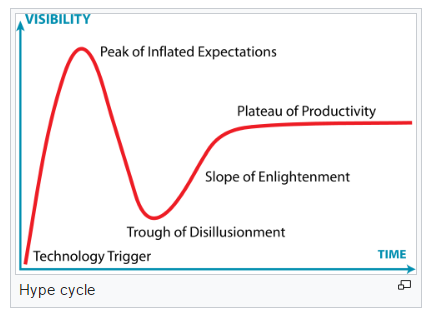 What tools sets are required to avoid the hype cycle? As mentioned in the previous article, excellent communications are a good starting point. The CDO must communicate the vision and strategy effectively across the organisation. This communication will be critical to manage the expectations and time scale of the delivery. Second is incremental value-add. Often a data strategy can be delivered as separate projects, or initiatives within the overall program. I have found that often pilot projects, or feasibility studies, can not only add value to the business by fixing an immediate issue, but can also show the business the art of the possible, helping to avoid the hype cycle. Alternatively an early delivery of a data governance framework, or a piece of advanced analytics providing new insight can also be very effective. The effective CDO will plan out a range of tactical deliveries that fit within the total strategic direction and communicate this well to the business, and the hype cycle will be avoided.